Now that I have settled back into life at the monastery, I am reminded almost daily how wonderfully blessed we are to be living where we do, close to wide open spaces. After spending several months in Chicago which was a beautiful city in many ways, and being close to Lake Michigan which was an added bonus, these days I relish being able to step outside anytime I want to go for a walk or just to the next building, aware of the beauty all around us whether it be the trees, the gardens, the fields or the quiet of an early evening. My heart can’t help being filled with gratitude at such times. I am fully aware that most people do not live in close proximity to large open spaces or to a lake or river as we do. In one way or the other each of us, depending on our circumstances, seeks to find ways to feed our soul. For us Sisters whether living in St. Joseph, MN or being at one of our two lake cabins, as four of us are this week, we find ways to be still and silent steping away for a time from the jabbering crowds and the constant motion of our lives. For example, as I am writing this I am sitting facing the lake on a porch with screen windows on three sides and listening to a pair of loons calling to each other on the lake, very close to our dock. The lake is calm after a very windy day yesterday, and being early in the week there is not the usual loud rumbling of motor boats assaulting our ears. There is the merest of fluttering in the trees and in an hour or so the sun will turn the corner of the house and will be facing us promising a beautiful sunset. An important piece during vacation that renews me body and soul are these quiet hours with congenial companions, along with extended time for meals, most often on the screened-in porch. May each of you experience something similar for the renewal of your spirit during these summer months. Gratefulness is the Heart of Prayer, as Brother David Steindl-Rast’s book title proclaims. We, here at Saint Benedict’s Monastery, having been praying heart-prayers for about ten days now. It started with July 4th when we acknowledged gratefulness for our country’s freedoms, the solidarity we feel with the citizens of all nations striving for basic human freedoms and the immense gratitude we extend to every woman and man throughout the world who offers/vows their lives to protect and promote these treasured freedoms. 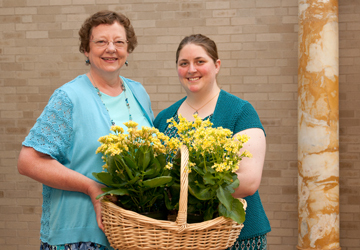 July 7th : two women, Angela McCormick and Nina Lasceski, chose to enter an intense year of discernment as Benedictine novices. This novitiate time of inner honesty is not always an easy path. The truths of Who this compassionate God is, who they are, and how this specific monastic community with all its wonderful humanness can accompany them on the road to freely manifesting their empowering gifts, is an awesome mystery. The over 1000 monastic women buried in our local monastic cemetery are part of the throngs of women who add their prayer-connection to both of them as they travel this discernment path. July 11th : one woman, S. Julianne Gilbert, sang out her perpetual monastic promises with the ancient words, “Receive me, O God, as you have promised and I shall live….” in tones that resounded with gratefulness. And at Evening Prayer, Novice Tamra Thomas became Sister Tamra as she signed her three year promise to continue her monastic formation. As the clapping community gathered around her she could not resist clapping her own hands and allowing herself to do a spontaneous mini “dance for joy”. 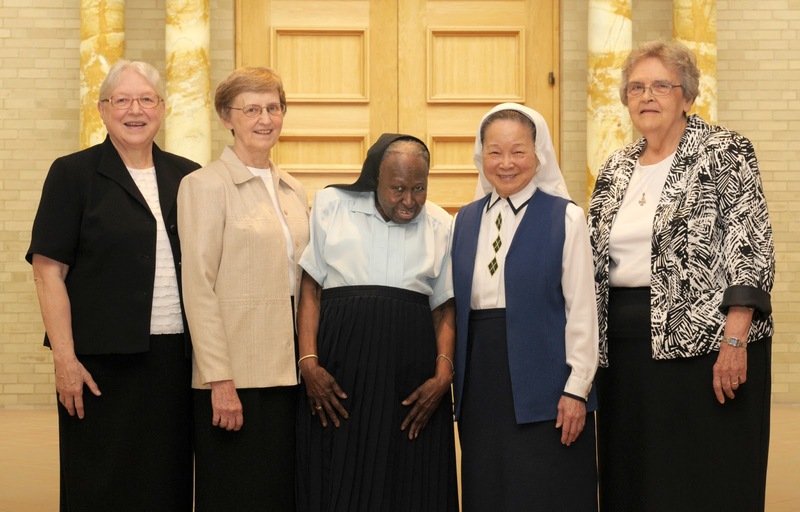 July 14th : culminated our ten days of celebratory vowed gratitude when sisters Ardella Kvamme, Ephrem Hollermann, Pauline Fernandes, Rosa Li and Susan Rudolf savored their 50 years of monastic life in royal Golden Jubilee splendor. 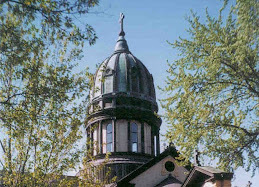 Our chapel dome rose a bit as instrumental music and song billowed upward. If another pronunciation of “Vow” is “Wow” (if spoken with a German twist), we have been “Wowing” for ten days straight. If “wowing” is another name for GRATITUDE, we have been in the heart of prayer for a delightful ten days. All it takes is a sunny day, a chair facing north east, trees reaching into a blue sky, a few ants or daddy-longlegs and a soft breeze to move the shadows upon the ground! That’s all it takes for me to feel at HOME . . . on earth, within myself, and with God (at least for the time being!). with a pastor who provides a rich diet of spiritual food and who meets people where they are (S.
easily dislodge it in the unloading. “Silas does that well. He takes it out in bunches like birds’ nests. too, do we, when we go HOME. My blog is a bit late this week, which means it's Fourth of July as I'm writing it. That makes me think. And it makes me grateful. I'm so grateful to experience living in freedom and all the things that go with that. It is a gift to be able to hold and express opinions without fear of being tortured or imprisoned. It is a gift to know that I can live in harmony alongside others who maybe don't think quite the same way that I do because, beyond our differences, is a commitment to the right of everyone to have freedom of speech. I'm conscious, though, that rights come with duties. I'm conscious, too, that I have a duty to support those who don't live in the same freedom that I enjoy. I maybe can't change the world, but I can try to play some part. So, today, I'm thanking God for my freedom and praying for all those people throughout the world who live under oppression, and for all those who strive to promote justice and peace. PS The monastery blog next week will be published on Weds.